I'm sure most of you are aware of my addiction when it comes to magazine 'freebies' and I have to confess that sometimes it is a while before I get around to actually using them (if at all sometimes!!). However I've been using the ones which I picked up recently and here is another card which incorporates the free embossing folder, an image from the free papers supplied and various die cuts. I've also used a couple of dies from my collection to add to the scene. 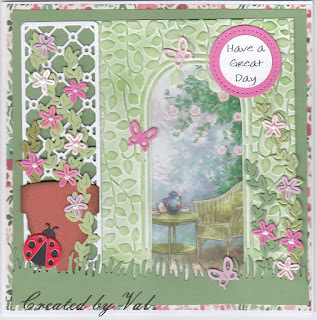 I started with a square of green card which was layered onto a square of one of the pretty papers in the set. The archway was embossed onto some white card and sponged with matching green ink before cutting away the actual arch so that I could pop one of the free images behind. The trellis was die cut along with a good selection of flowers, butterflies and leaves. The grass along the bottom was cut with a die from my collection as was the large flower pot and a ladybird. The trellis die wasn't really long enough for this card so it was cut twice and joined - hence the flower pot to hide the join - cunning or what? 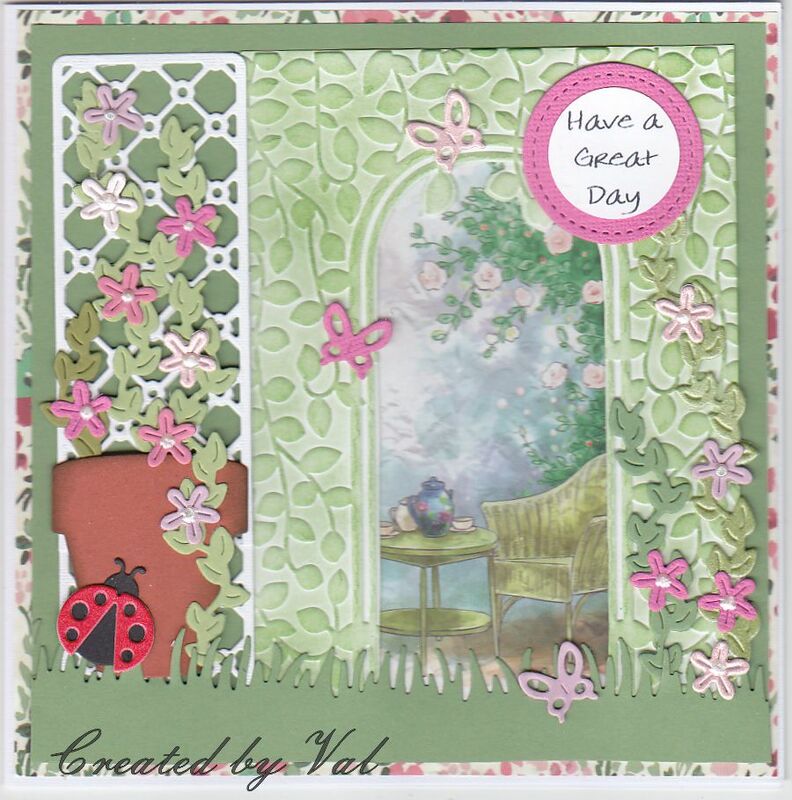 A gorgeous card Val, I love the embossing folder and the different dies you've incorporated into the card, especially the little ladybird.